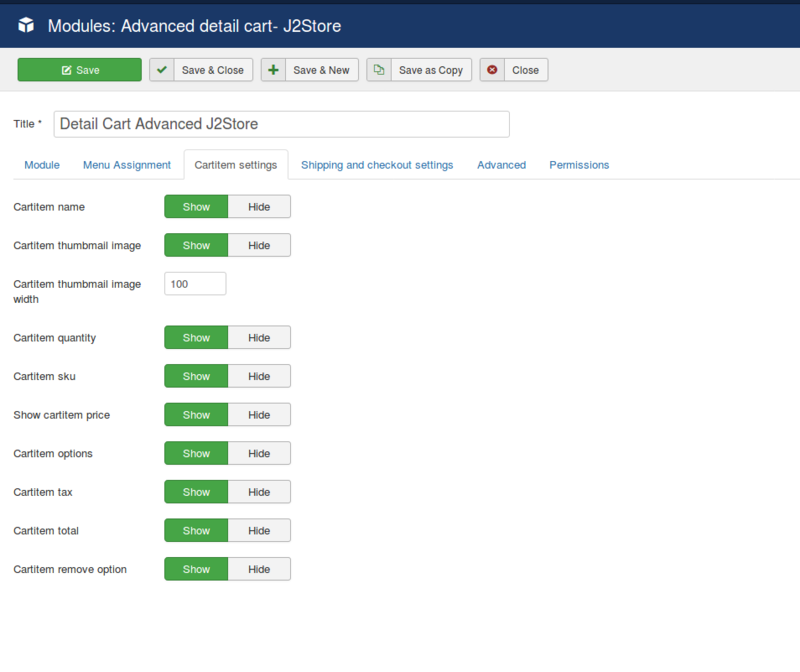 With the J2Store Detailed cart module, you could display a miniature view of the cart page anywhere you wish. Provisions are available to display the product images, shipping and tax estimator, quantity, options and so on. This saves the user's time and allows them to have a look at the cart page anywhere on the site. You could download the module from the following link and install it using Joomla's default installer. 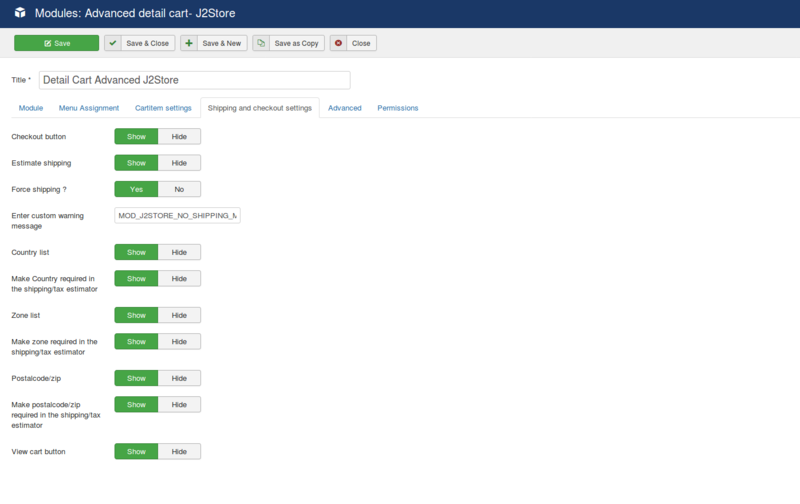 Once you install the app, the next step is to Navigate to Extensions->Modules->	Detail Cart Advanced J2Store and enable it. Cart Item name Set this option to Yes when you wish to show the names of the items in the cart. Cartitem thumbmail image Setting this option to Yes would display the product image of the items in cart. Cartitem thumbmail image width This allows you to set up the width for the product's thumbnail image of the line items in cart. Cartitem quantity This option allows you to choose if you wish to show the number of items of a particular line item that is in the cart. Cartitem sku Enabling this option would display the SKU of the line items available on the cart. Show cartitem price Set this option to Yes if you wish to show the price of the line items available on the cart. Cartitem options Set this option to yes if you wish to show the options chosen by the users if the products on the cart have options associated with them. Cartitem tax This setting should be set to Yes if the tax of the items in the cart should be displayed. Cartitem total When this option is enabled, the total of the order would be displayed in the module. Cartitem remove option Setting this option to Yes would show the option(trash icon) to remove items that have been added to the cart in the module. Checkout button Set this option to Show to show the checkout button in the module. Estimate shipping If you wish to see the estimator tool on the module, set this option to Yes. Force shipping ? If you wish to prevent users from checking out without choosing the shipping methods, set this option to Yes. Enter custom warning message Enter the message you wish to show when a user tries to checkout without choosing the shipping. A language override could be created for multi-lingual sites for the constant mentioned in the textbox there. Country list Choose Show to display the countries list on the module. Make Country required in the shipping/tax estimator Setting this option to Yes would make the country selection option as a required field on the estimator displayed on the module. Zone list The list of zones would be displayed on the shipping and tax estimator in the modulewhen this option is set to Show. Make zone required in the shipping/tax estimator Setting this option to Yes would make the zone selection mandatory in the module before checking out. Postalcode/zip Setting this option to Show would display the textbox to enter zip code in the module. Make postalcode/zip required in the shipping/tax estimator Setting this option to Yes would make the postal code selection mandatory. View cart button Setting this option to Show would display a link to the cart view.